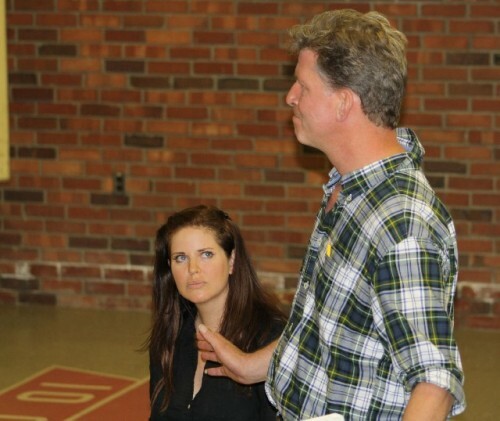 Actress Clover Bell-Devaney (Sister James) and Patrick White (Father Flynn) rehearse a scene from Berkshire Actors Theatreâ€™s production of "Doubt"
Berkshire Actors Theatre’s Founding Artistic Director Clover Bell-Devaney holds double-duty as actress and producer this summer. Berkshire Actors Theatre Founding Artistic Director Clover Bell-Devaney will hold double-duty as actress and producer this year for both "Doubt" and "Four Dogs and a Bone"
“But it’s so unsettling to look at things and people with suspicion. It feels as if I’m less close to God,” says the character of Sister James at one point in John Patrick Shanley’s Pulitzer Prize-winning play, Doubt: A Parable. The line comes at a moment of indecision for the character, a young nun who finds herself unsure of what the truth is, overcome by, well, doubt. It’s a great, quiet role –– part of a quartet of characters forced to confront the reality of their own lies, loss of idealism, and sense of guilt against the backdrop of a conservative 1964 Bronx Catholic school where nuns and priests aren’t even allowed to be alone in the same room together. While the other three roles in the play are given artful speeches, Sister James is a quiet presence in the center of the storm. Sure, her faith is tested as the play unfolds, but she does her best to offer a few rays of hope in Shanley’s dark world. It is a role that has certainly brought acclaim to the actresses who have played it –– Amy Adams earned an Oscar nomination, and Heather Goldenhersh received a Tony nod for their performances in the film and original stage adaptations of the play, respectively. This summer, Berkshire Actors Theatre’s Founding Artistic Director, Clover Bell-Devaney, will get the chance to sink her teeth into the role, as BAT presents the play in repertory with a revival of their production of another Shanley piece, Four Dogs and a Bone, which drew rave reviews from the area’s critics last year. With a new summer season home at Berkshire Museum, BAT is continuing its commitment to staging intimate, professional productions of modern classics in the Berkshires, and Bell-Devaney, is once again ready to pull double-duty as both actress and producer. Not only will she play Sister James, but she will also reprise her Four Dogs and a Bone role from last summer, a challenge that she can’t wait to take on. For Bell-Devaney, part of tapping into that spirituality inherent in the role meant going directly to its source –– the woman who inspired it all. A few weeks ago, Bell-Devaney had the opportunity to meet with Sister Margaret (“Peggy”) McEntee of the Sisters of Charity at Mount Saint Vincent College in the Bronx, NY, where the movie adaptation of “Doubt” was filmed. Sister McEntee’s meeting with Bell-Devaney certainly did not mark her first encounter with the play, for after all, she was Shanley’s first grade teacher, and the real-life inspiration for Sister James. Bell-Devaney was first put in contact with Sister McEntee by Shanley himself. Unusual for a theatre of its size, BAT has been fortunate enough to have Shanley on board as a creative consultant during the planning stages of its 2012 season. First introduced to his work when she was an acting student at Carnegie-Mellon University, Bell-Devaney reached out to Shanley after the success of Four Dogs and a Bone last summer, wanting to discuss his plays and the possibility of BAT bringing more Shanley work to the Berkshires. The two have been friends ever since. Just as meeting Shanley was a formative moment for BAT, Bell-Devaney’s meeting with Sister McEntee was a unique experience as she prepared for her role, having never previously met the real-life inspiration for one of her characters. “It was inspiring meeting Sister Peggy. John had described her to me as ‘lovely, practical, and good,’ and she is all of those things, as well as funny, perceptive, smart, and very real,” Bell-Devaney said. Apparently meeting her was also the boost Bell-Devaney needed to finally cement her lines in the play. Certainly etched into Sister McEntee’s cells is the desire to carry out the service work that the Sisters of Charity are defined by. Having taken her vows at the age of 18, Sister McEntee was a young elementary school teacher who in the pre-Vatican II days had to change her name to Sister Marita James. Now 75, she has spent her entire adult life with the Sisters of Charity in New York, a group whose foundations date back to 1817 when Baltimore-based Saint Elizabeth Ann Seton sent three of her fellow sisters to start an orphanage in New York City. Dedicated to charitable work and education, the group is at the center of Doubt, in which Sister James and the indomitable Sister Aloysius (played by Peggy Pharr Wilson in BAT”s production) are forced to confront a very ugly rumor surrounding the ever-charming Father Flynn (played by Patrick White), a religion and physical education teacher at the school. Still working full-time as a teacher at Notre Dame School in Manhattan, Sister McEntee had not been in touch with her former student-turned playwright for about 40 years, until she heard about “Doubt” and its focus on the Sisters of Charity. After she tracked him down, the pair got back in touch, and she ultimately became very closely-involved with the play, serving as a technical advisor on the 2008 film adaptation, offering advice to Adams and Meryl Streep. While the play itself is dedicated to “the many orders of Catholic nuns who devoted their lives to serving others in hospitals, schools and retirement homes,” the film is dedicated specifically to Sister McEntee. Berkshire-area audiences will have the opportunity to hear about Sister McEntee’s experiences themselves in an audience talk back following the 5 p.m. July 1st performance of Doubt at Berkshire Museum. For Bell-Devaney preparing for the role of Sister James has proven an interesting process so far. 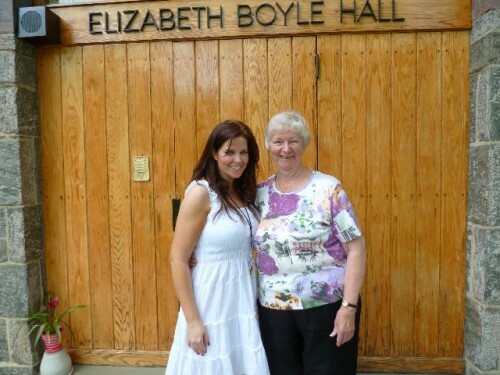 While she was raised in an intellectual, non-religious family, she could understand the strong sense of spirituality and the bond that the Sisters of Charity all share. While visiting Mount Saint Vincent College, Bell-Devaney saw first-hand the camaraderie shared by the sisters, many of whom have been working together side-by-side for decades. “While I don’t go to church, I have had in my life, personal religious experiences that have made me feel that I can relate deeply enough to this role, to play it very effectively,” Bell-Devaney said. After spending half a decade working the daily grind of a New York actress, full of auditions and callbacks while amassing an impressive array of theatre and television credits, followed by another period of years in the Berkshires away from the theatre as she raised a family and ran a successful event planning business, Impeccable Events, Bell-Devaney decided to trust her own faith in her love of theatre by starting BAT in 2011. Berkshire Actors Theatre’s 2012 season runs from June 21-July 15th at Berkshire Museum. For more information on the theatre go to www.berkshireactorstheatre.org. For tickets, visit Berkshire Museum’s front desk, or call (413) 443-7171, ext. 10. The talkback with Sister Margaret McEntee will be held at the museum following the July 1, 5 p.m. performance.